We applied and got a small grant from Manchester City Council to put on an Awareness Event during Hate Crime Awareness week (5th-11th Feb 2018). We had 38 people attend the event, the aim of which was to raise awareness, increase reporting and celebrate diversity. We also had 3 volunteers supporting us on the day to help set up, take the register, hand out goody bags, and clear away after the event. Our guest speaker was Shazia Awan, Communities Coordinator from MCC Community Safety Team. Shazia spoke about what Hate Crime is, the current statistics and how to report it. During her talk participants were asking questions and getting involved in the discussion. She highlighted that the way to report hate crimes is through the online reporting portal tool called ‘True Vision’ which can be found by clicking here. Next was lunch from Mann-Salwa, a halal caterer; lots of people commented on how nice it was. During lunch people had a chance to chat and get to know each other; the centre was a buzz of voices. After lunch our Centre Manager Giselle Bawden spoke led the launch of us becoming a Third Party Reporting Centre (TPRC). The community centre can provide a quiet space for any person who wants to report a Hate Crime where they would be supported by staff to use the online reporting tool. We hope that being able to come to the community centre to report will help the person feel less isolated and more supported by their community. They can access any support and services we offer and/or be signposted to the relevant organisations. Again, during this there was lots of participation and discussions from the attendees. Next Fiona Gallagher our Community Development & Volunteer Coordinator led on an interactive “What’s Unique About You” session highlighting the positives of diversity. She asked participants to write on a post-it note what is unique about them, perhaps a hobby or something personal or what they like doing; this celebrated what makes everyone unique and different. Then she grouped together the characteristics and asked all the people from each group to come up to get a photo together. This highlights and celebrates that no matter who we are we are all important and have common ground with other people no matter the difference in cultures or ethnicity. Lastly we had a free raffle where there were 6 prizes, including a large box of vegetables donated by FareShare! 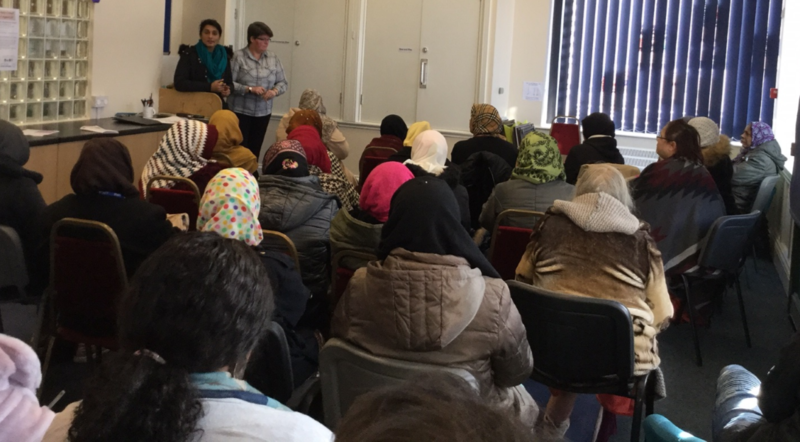 Since the event, one of the participants who works at a local women’s charity in Longsight has called up to report a hate crime. We went through the online procedure and form with her on the phone so she is now confident to use it on her own in the future.